Ever since the Brexit referendum, the CEP has been attempting to highlight how England and English concerns have been ignored by the British government’s discussion on Brexit. The only time that the people of England were consulted about their views was at the Brexit ballot box. Whatever your view, as a member or supporter of the CEP, is on Brexit (Remainer or Brexiteer), Theresa May as the head of the British government has refused to create an English First Minister or English Brexit Minister during the Brexit process and that is not acceptable. Whatever Theresa May has been saying about protecting the integrity of the UK, she has been out maneuvered by the E.U.. If you ignore all her paraphernalia about standing up for the U.K. as ‘a whole’, she is carving a new U.K. border down the Irish sea. If Theresa May’s Brexit withdrawal agreement is accepted, then she, as the British Prime Minister, would have naively given the Republic of Ireland a golden opportunity to call for a border poll that would mean the island of Ireland could once again become united. Who, then, would be able to ignore that the U.K. would no longer properly exist if it excludes Northern Ireland? Did she really believe that the Irish republicans would not notice the D.U.P. recoiling from being rejected and sacrificed as lambs on the Conservative and Unionist party’s altar to the E.U.? If the head of the Unionist Government is willing to accept different terms for an integral part of the U.K., then it is not rocket science to think that her Brexit withdrawal agreement might have a domino effect on the other nations across the U.K.. Be assured, Irish independence would be the beginning of the end for the U.K. (as we all know it), because it would, essentially, be jettisoning part of itself when Northern Ireland goes! But that might also usher in a new era of English politics and a desire to see England being fairly treated. 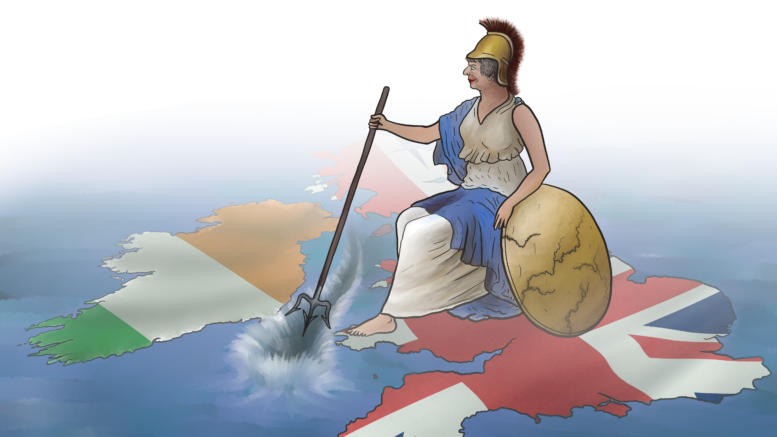 What have English patriots now got to lose by creating a new border down the Irish sea – because the British Prime Minister just completely ignored any call for an English voice throughout the whole Brexit process anyway? Campaign for an English Parliament. If you like our cartoon please forward it on. 2 Comments on "Britannia Carves the Kingdom!" Maybe it is time to accept that what is good for England is not good for the rest of the UK. Blair and Brown were Scotsmen who were a disaster for England, who helped our population density reach crisis proportions while Scotland has about a sixth of population density. Perhaps it is time for England to break free from, not only the EU, but the rest of the UK. The reign of Edward I (reigned 1272–1307) was rather more successful. Edward enacted numerous laws strengthening the powers of his government, and he summoned the first officially sanctioned Parliaments of England (such as his Model Parliament ). He conquered Wales and attempted to use a succession dispute to gain control of the Kingdom of Scotland, though this developed into a costly and drawn-out military campaign.